Mulching the beds and trees is an important to keeping the landscaping of your Atlanta home or business both healthy and looking its best. Mulch helps to control weeds and retain moisture in the soil. Mulch also keeps plant roots insulated so they stay cooler in the summer and warmer in the winter, it can also be important in controlling erosion. For some people it is a matter of personal preference, but different materials do have their advantages and disadvantages. 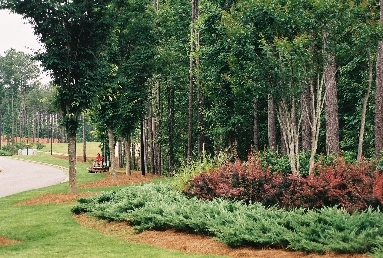 Pinestraw has been used in Atlanta and throughout the south for several decades as the mulch of choice; partially due to its availability and partially due to its advantages. Due to the pine needles’ shape and size they tend to interlock and weave a mat that covers the ground. This pinestraw mat is very porous and allows more water to reach the plant than any other mulch material. The interlocking qualities also help pinestraw stay in place and not get washed away as quickly as some of the smaller pieced bark mulch. Pinestraw is a natural product that blends in well with the surrounding landscape due to its color and texture. One disadvantage of pinestraw is that it breaks down and loses its color quicker than other mulches. There is a wide variety of colors available to complement your landscaping when using wood mulch. This gives consumers an additional choice of how they impact their landscape. There are also several varieties including – pine, hardwood, cypress, and cedar. In addition there are also size variations available. Wood mulch does not break down as quickly as pinestraw but it does fade and needs to be refreshed regularly. Care must also be taken so that excessive layers of wood mulch do not build up around plants. It is best to periodically remove the old layer(s) of wood mulch before installing the new. The team of landscaping professionals at Hutcheson Horticultural install and maintain landscaping throughout the Atlanta area and would love to work with you to determine the best choice of mulch for your home or business. Call us at 770-924-1001 or use the convenient “Contact Us” feature on our website.